Join us at your local store! We have been working hard at our various fundraising store collections and would like to say a huge thank you to everyone who has helped us at our previous collections, awareness raising events and bag packing events; with your help, we raised an incredible £3600.47 in 2018! Raising funds is a big part of our work but equally important is the role of promoting the services that the charity provides to people who may be struggling with sight issues and don’t know where to turn. Our volunteers and particularly our service users who have volunteered to help us at these events are best placed to tell people what we do and we are very grateful to the growing numbers helping to promote our work. We have quite a few events booked for the upcoming months so if you would like to volunteer, please give us a call on 01476 592775… the more the merrier! Following on from the Annual General Meeting last July I have been working hard on converting our unincorporated Charity into a Charitable Incorporated Organisation. Following many meetings with advisors, solicitors and some of our volunteers along with many back and forth communications with the Charity Commission we have finally been informed that our new organisation has been given full approval and we now have a new Charity number: 1182486. My thanks to those individuals who have given me and the Society such valuable advice and support in making this change. My thanks also must go to our staff team who have now begun the tedious task of ensuring every piece of correspondence has the correct charity number. How glad am I that we have one of the best small staff teams ever who are given such tremendous support from many willing volunteers. We have applied for a project in the Holbeach area and have been chosen to go forward to a vote in Tesco Supermarket in Holbeach where customers will decide the outcome by voting for their favourite project each time they shop. The voting for SLBS is taking place from Friday 1st March to Tuesday 30th April. The project with the highest number of votes could receive £4,000, second £2,000 and third £1,000. Please help us!…. if you or your friends and family shop at Tesco in Holbeach or are passing by, make a purchase and choose South Lincolnshire Blind Society as your favourite project… we could receive £4,000 to help us with our project of Combating Isolation for Blind and Partially Sighted people. A huge thank you to Asda Grantham and the local community! A huge thank you must be said to the local community in Grantham for voting South Lincolnshire Blind Society in the Asda Green Token Scheme. 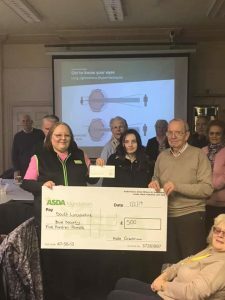 Picture above shows Asda’s community Champion, Karen presenting the cheque for £500.00 during Socialeyes to our President Mr Geoffrey Caunt and Fleur one our regular members. Be My Eyes App ! ‘The Be My Eyes app allows volunteers to be eyes of the visually impaired. 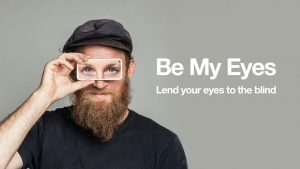 Be My Eyes, the award-winning app that has eased the lives of 113,000 blind people in 150 countries, is so successful it has more volunteers than it knows what to do with! The idea is simple: a blind or visually impaired person needs help with a task. They make a live video call to a sighted volunteer, who can tell them if the milk has expired, check the label on their medication or help them find the cash they have dropped on the floor. South Lincolnshire Blind Society is proud to have joined the Seven Steps initiative! 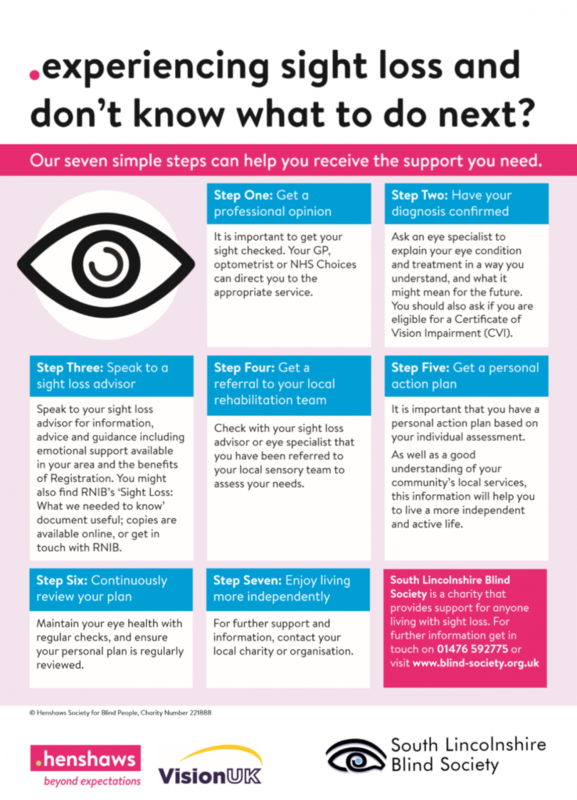 The Seven Steps Programme is a much needed roadmap for anyone dealing with a visual diagnosis, which was launched by the sight loss charity Henshaws. 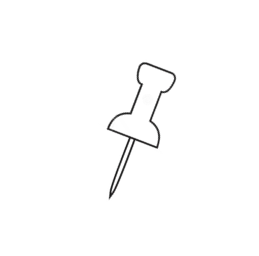 The aim is to reach as many people as possible with quality information, advice and guidance. Henshaws staff and service users worked together with Greater Manchester NHS to co-produce the Seven Steps, which has been supported on a national scale by Vision UK, and we’re pleased to be one of the partner organisations for the project. The guide can be displayed as posters, leaflets or boards in hospitals, clinics, and community hubs working with visually impaired people across the UK. We’re hoping to spread the Seven Steps as far as possible by getting volunteers, members of the public, and businesses to share it – whether that’s displaying as posters, sharing on social media, etc. – to ensure that no one goes through sight loss alone. For more information on the initiative, or to share posters of your own, get in touch on 01476 592775. Start collecting your used stamps! Support us by collecting your used stamps both old and new and send them into our Grantham Office, which we can then trade in for cash! Simply give us a call to request a pre- paid and addressed envelope and help us to raise some vital funds. Making walking groups inclusive for people with impaired vision. ‘An anthropologist at the University of Sussex has contributed to a set of guidelines detailing best practice to make walking groups inclusive for those with impaired vision. Designed to support and enable those with impaired vision to take part in group walking activities, Dr Petty is hopeful that the guidance will give walking groups the tools to welcome walkers who have impaired vision, supporting opportunities for everyone to enjoy being outside in nature. Information on different types of sight impairments. How group walks can benefit people with sight impairments. How group walks can be made safe and welcoming for people with sight impairments. 10% of ticket costs go towards local good causes! For more information or to start supporting, visit https://www.lotterysk.co.uk/support/south-lincolnshire-blind-society.